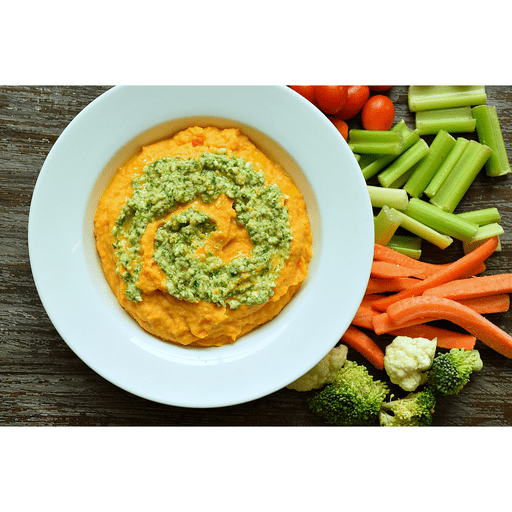 Sweet, smoky, fresh and tangy, our Sweet Potato Hummus with Cilantro-Cashew Pesto is pure perfection! Serve this nutrition and flavor-packed dip with fresh veggies or toasted pita bread the next time you’re entertaining or simply enjoy as a delicious afternoon snack. 1. To make hummus: Add cooked potatoes, olive oil, chickpeas, tahini, garlic and lemon juice to a food processor and blend until smooth. Blend in cumin, cayenne, salt and pepper, adjusting to taste. Set aside. 1. To make pesto: add cilantro, cashews, garlic, olive oil and lemon juice to a food processor and blend until smooth. Add salt and pepper, to taste. 1. Spoon sweet potato hummus into a serving bowl. Swirl in pesto and serve with fresh cut veggies, whole grain pita bread or crackers. Calories 180, Total Fat 10g (Saturated 1.5g, Trans 0g), Cholesterol 0mg, Sodium 35mg, Total Carbohydrate 19g (Dietary Fiber 4g, Sugars 4g), Protein 5g, Vitamin A 120%, Vitamin C 15%, Calcium 4%, Iron 10% *Nutritional values are an approximation. Actual nutritional values may vary due to preparation techniques, variations related to suppliers, regional and seasonal differences, or rounding.